The new product Time IV (2013) is an updated version of Time III introduced earlier in the Market. 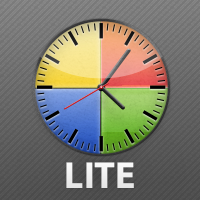 The indicator displays the work time of world marketplaces in a separate window in a convenient way. 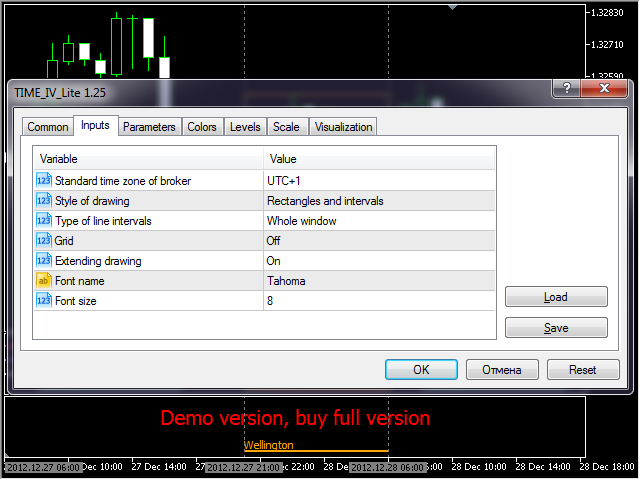 The indicator is based on the TIME II (VBO) indicator rewritten in MQL5 from a scratch. The new version Time IV is a higher quality level product. Comparing to Time III it consumes less resources and has optimized code. The indicator works on Н1 and lower timeframes. The broker time is set to UTC+1, and it cannot be changed. The number of sessions is limited to one. Full version can be purchased here. Standard time zone of broker - broker time in the UTC+ format. Rectangles and intervals - rectangles and intervals. Rectangles only - rectangles only. Intervals only - intervals only. Don't draw - no drawing. Whole window - throughout the whole window. Indicator only - on the indicator only. On - enabled. Drawing in advance, can decrease the performance on slow computers but the graphics becomes smoother. Off - disabled. Drawing in the visible part of a chart, maximum performance but displaying lags when scrolling (for a split second). Font name - font for displaying the session names. Font size - font size. This size affects the height of the indicators.